Fourteen Connecticut schools have been selected by the Connecticut Association of Schools as the recipients of the 2014 CAS-CIAC Endowment and Flanagan Grants. Through the generosity of corporate partners, the CAS-CIAC Endowment and Flanagan Grant Program was able to provide $34,550.00 in grants this year to new or existing initiatives that meet the endowment’s and fund’s requirements and would not otherwise be afforded by CAS member schools. In order to be funded, grant applications must meet demanding program criteria, impact a significant number of students, and support pathways of learning that are creative, exciting and engaging. This year’s CAS-CIAC Endowment and Flanagan Grants were awarded to the following schools and programs. Reading Together Builds Character is a family based program which will incorporate literature with character education. Students and their families will read the same novel and partake in a variety of activities to increase literacy. This program has the potential to extend literacy into the home and community, build stronger family relationships, encourage more students to read for leisure, and strengthen the school’s current character education program – Jackie’s Nine Breaking Barriers. Breaking Barriers focuses on determination, teamwork, integrity, citizenship, courage, justice, persistence, commitment and excellence. CAS Director of Student Activities Dave Maloney presents check to Region 14 and 15 representatives. 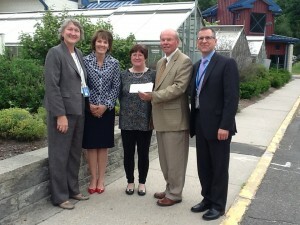 Pictured above are, left to right, Sue Domanico, Director of Instruction; Susan Ruddock, Bethlehem Principal; MaryLou Torre, Mitchell Principal; Dave Maloney, CAS; and Matt Salvestrini, Gainfield Principal. All three of these schools will utilize the grant funding they receive to assist in the startup of the Responsive Classroom program in their schools. Responsive Classroom is a research and evidence based approach to elementary education that leads to greater teacher effectiveness, higher student achievement, and improved school climate. This program addresses the social and emotional components of the learning environment and contributes to building school community, creating a common language and approach to social skills, accountability for learning, and supporting a safe school environment. The Wellness Committee at Buttonball Lane School promotes a number of healthy initiatives within the school. Currently many opportunities exist both before and after school that encourage students to participate in physical activities that they might not be engaging in at home. This past year the Wellness Committee invited students to participate in the first ever KiDSMARATHON at the school. KiDSMARATHON is an exercise program in which students run or walk the equivalent of a marathon over the course of 8-10 weeks. They record their distances and then come together as a school community to run the final mile together. Thirty four percent of the Buttonball Lane student body participated in the KiDSMARATHON this past year, and with the aid of this grant the school goal is to have 80% of the students participate next year. The KiDSMARATHON is not only a great opportunity for students to take part in a physical activity as a community, but the program also promotes teamwork, positive character building, self-esteem, self-respect, and self-confidence. The Student Leadership and Ambassador Program will help students to develop leadership, interpersonal, and management skills in order to positively influence their peers and the entire Crosby Community. Approximately 25 to 30 freshmen and sophomore students will be recruited to pilot the program in the 2014-2015 school year. Students will meet weekly during leadership workshops in which they will be mentored by program advisors. The students will receive instruction in leadership oriented topics and will be trained in how to plan and be given the task to plan multiple school wide programs and community service activities. Students in the program will go on to serve as student ambassadors in their junior and senior years. As ambassadors these students will mentor freshmen and transfer students and will serve as leadership coaches for new students entering into the leadership program. In Haiti disease from bad water contributes to a fatality rate of approximately 50% for infants and children. Clean water would greatly reduce this statistic. Starting in the 2014-2015 school year Farmington High School will initiate the Safe Water for Children of Haiti Program. Open to all students, the objective of the program is for the students to collectively research, design, fabricate, test and install a Solar Disinfection System (SODIS) for the children of Haiti. Students will first successfully test their completed SODIS in Connecticut and then proceed to test in locations in Haiti for eventual installation at designated Haitian locations that serve selected schools and orphanages. The Career and Technical Education Program (CTE) is an eight week after school enrichment program at the high school in which 7th and 8th grade students engage in areas of focus that include manufacturing, early childhood education, culinary and medical careers, and various other non-traditional occupations. Participation in this program and exposure to the CTE courses prior to high school assists greatly with the transition to high school. Allowing 7th and 8th graders the opportunity to establish a connection to a high school teacher and become familiar with the new building, while engaging in activities in their area of interest allows for them to build a bridge between middle school and high school. The Shoreline Mathematics Challenge, held at Haddam Killingworth High School, provides an opportunity for high school calculus students from the 13 shoreline conference schools, and one other school outside of the conference, to come together to compete in a full day event revolved around mathematics. The day begins with a student produced mathematics video contest. The contest is judged by the HKHS Technology Department head as well as several college professors, representatives from the states regional consortiums, and faculty from schools outside of the conference. The second part of the day provides hands-on and thought provoking challenges for the students and concludes with an awards ceremony. The program helps to connect students from different schools in a fun and learning environment that encourages an appreciation for math, while encouraging teamwork and helping to develop logical reasoning skills. Project WEB – Where Everybody Belongs – is an internationally recognized orientation and transition program designed to address the unique needs of the middle school student. The WEB program utilizes 8th grade peer mentors to facilitate learning experiences and instruct 6th graders in valuable lessons on how to be successful in the middle school. Underscoring the importance of assisting students with the transition from an elementary school to a middle school model, the WEB program assists students to develop positive relationships with others, navigate new and higher academic expectations, and become integrated into their school community. These skills and experiences help to set the stage for student success. The WEB program provides the opportunity to have students help fellow students not only negotiate and flourish in a new school environment, but also build and strengthen the school community creating a positive and inclusive school climate. 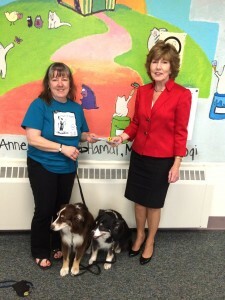 Mansfield Middle School, Storrs – When Reading Gets Ruff! The main goal of this program is to create a Reading Zone that is inviting and motivating for those students who struggle to complete their 15 minutes of nightly sustained reading. A high motivator of When Reading Gets Ruff! will be the presence of certified reading therapy dogs that students can either read aloud to or just sit with and read silently. This program will provide a comfortable, reader friendly space, access to appropriate books or eBook options, literacy strategies, and the certified staff needed to help the students achieve their daily reading goals. The HEART program, still in its infancy, is a character education initiative. The intention is that the tenets of the program – Honesty, Effort, Attitude, Respect, and Teamwork – will permeate through every aspect of the school community and transfer to the students’ daily lives outside of the school. The foundational component of the initiative will be monthly assemblies that promote the work being done and shining a spotlight on the achievements of the students. Each assembly will be anchored by a special guest speaker from the community who focuses on one of the aspects of HEART and how students can take on a leadership role in promoting the concept in their communities. Extensions of the program will also exist in the form of the HEART Helpers, a group of students who will participate in an after school community volunteer group, and HEART and Soul, an in school lunch group of students who will plan, organize and implement school wide activities. Every August, Wamogo High School hosts Froshfest, a freshman orientation program for all incoming students and their families to help facilitate a successful transition between middle and high school. Over the course of four days Froshfest staff and peer leaders orchestrate summer camp like activities such as team building, field games, paintings, tie-dye, scavenger hunts, and water carnivals. These activities are the platform through which essential information on student life and concepts from the school’s mission statement and core values is delivered. The primary objectives of this program are to provide new students and families with academic and logistic information necessary for a smooth academic transition, and to encourage positive peer integration between members of the freshmen class. The goal of the Strong Initiative is to create an incentive for all students to begin to work toward graduation from the beginning of their freshmen year and continue on the path through their senior year. Each year has a focus of strength: freshmen year – Start Strong, sophomore year – Be Strong, junior year – Stay Strong, and senior year – Finish Strong. During their four year high school career students are exposed to opportunities that will help them develop skills of success. Activities include motivational speakers, leadership exercises, interactive workshops, and interviews with business professionals. Strong awards are given monthly to recognize students for their hard work and success using the Strong acronym.